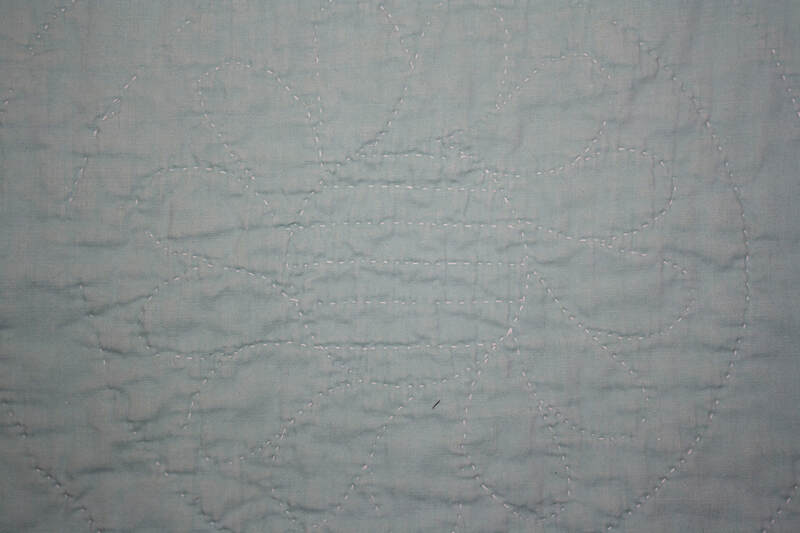 It was only after my Grandmother’s Sister-in-law, My Great Aunt Marion died that I learned she was a quilter. 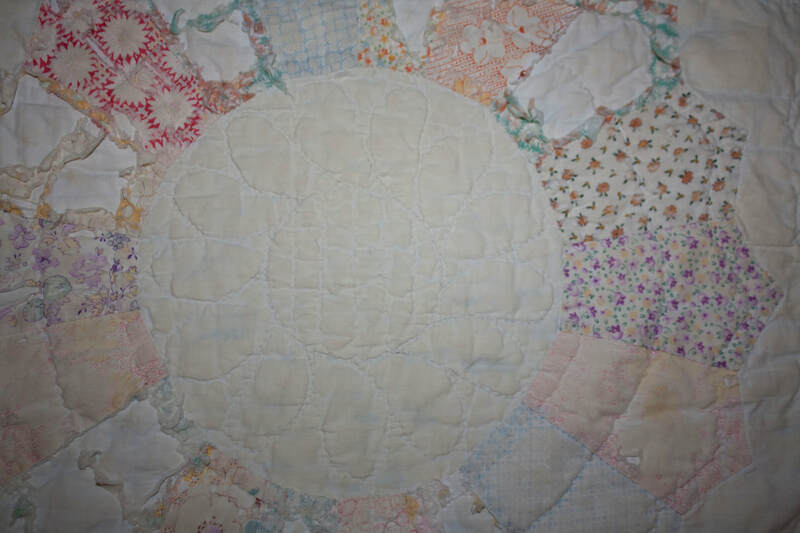 The heartbreak of learning that the woman who lived right next door to me my entire life also quilted, and I never knew, propelled me to ask her family for any little piece of her that they could spare. Since I was last on the list, I was given a box containing all of her cut pieces, since I doubt anyone else knew what to do with them, and 3 VERY well worn quilts. Originally I had visions of taking the fabric and repairing the quilts. They lived in a container in my studio for many years waiting for that. As time passed, I thought that maybe repurposing them would be the best way to preserve them, or what was still left of them. When I finally took them out, gave them a good cleaning and examined them, I realized that they were even worse than I had anticipated. This is one of the three ~ a Dresden Plate style quilt made of 30's fabrics, on a white background, with mint green and lavender borders. There were many places where the fabric and batting had been worn to the point where the mint green backing was showing through. I was ready to give up on this quilt, the damage was just too bad. Of the 20 pieced spokes, there was only 1 in good enough shape to save. Luckily, that one was on a corner so I would also have an example of the borders and corner treatment. ​I will finish the raw edges, document as much as I can about my Great Aunt on it, and either hang it up or use if as my own hot mat. When I folded the quilt up to put it away, the back caught my eye. The quilting motifs were stunning and the color was perfect. ​Instead of using the front, the shredded wheels, I decided to use the back as the front and showcase these beautiful hand quilted motifs my Great Aunt so lovingly stitched. ​That way, through these hot mats, her work will live on.